Dieser Artikel wurde 4757 mal gelesen und am 06.07.2016 zuletzt geändert. In 2015, record levels of refugees, migrants and forcibly displaced people moved across international borders. The issue of large movements of refugees and migrants is too big for any one State to handle on its own. We must work together to find durable solutions. The existing systems to deal with refugees and migrants are not coping. How many people have crossed international boarders as migrants or refugees? The number of inter-national migrants—per-sons living in a country other than where they were born—reached 244 At least one fifth of humanity lives in countries experiencing significant violence, political conflict, and insecurity. 20 million in 2015 for the world as a whole, a 41 per cent increase com-pared to 2000. This figure includes almost 20 million refugees. Where has that been occurring? The most notable movements occurred in South-East Asia, the Middle East, North and sub-Saharan African, Central America and Europe, while the impact was felt across the globe. Most were fleeing conflict, persecution, poverty or some other threat to their life and well-being; all of them in search of a better life. What would be the cost of not taking action now? High levels of armed violence and insecurity have a destructive impact on a country’s development, affecting economic growth and often resulting in long standing grievances among communities that can last for generations. 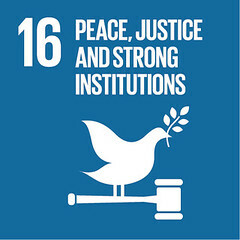 Sexual violence, crime, exploitation and torture are also prevalent where there is conflict or no rule of law, and countries must take measures to protect those who are most at risk. At least one fifth of humanity lives in countries experiencing significant violence, political conflict and insecurity. If we don’t address the issue, more than 50 per cent of the world’s poor are likely to live in conflict-affected and fragile states and this percentage is projected to increase to 82 per cent by 2025. But I’m neither refugee nor migrant. The world is at a critical juncture. We are witnessing the highest level of human suffering since World War II. Every day, civilians are deliberately or indiscriminately killed in wars. Preventing conflicts and finding political solutions to resolve them is our first and foremost responsibility to humanity. All migrants and refugees must be treated with respect and dignity. We must counter xenophobia, discrimination and violence against those seeking protection. Refugees have the right to seek asylum and safety. As a citizen, take a genuine interest in what your government is doing, and raise awareness in your communities about the realities of conflict and the importance of peaceful and just societies. · organizations to promote peace and justice. we can make crossing international borders a matter of informed choice, not desperate necessity. Ask your government what they did since 2015 to reach the 12 subgoals!